Horico Diamond Discs are made by a special bonding process that adheres the diamond grit very tightly to the disc for many hours of use. Because the diamond used for these instruments is so hard, they can be used on materials that are too hard for steel or carbide burs. Also since the mandrels are made from stainless steel they can be cooled in water and not rust. 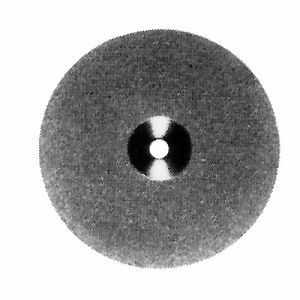 All Horico diamond discs are sold on a 3/32" shank. This is a Non-Stock Item - Delivery is 7-10 days. Double Sided: Diamond coating on both sides. Safe Inside: Diamond coating on outside surface. Product Size 19mm - 3/4"dia. 22mm - 7/8"dia.